Scott is passionate about helping entrepreneurs grow their businesses through practical, actionable advice. Connect with Scott on Facebook, LinkedIn, and Twitter. Need Signs Soon? 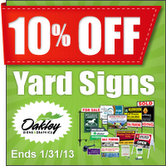 Get the Best Deal from Oakley Signs & Graphics! In addition to the helpful tips provided by the Tuesday Tactics Newsletter, Scott Levitt's the president of Oakley Signs & Graphics. Show your support for Tuesday Tactics by ordering your sign and sign-related supplies direct from Oakley online or by phone at 1(800)373-5330. Click here to shop this month's Tuesday Tactics sign special. Just reply to this email, or send a message to [email protected]. Scott and his team reads every message, and will respond personally. We love to hear from Tuesday Tactics readers! You can update your contact info or unsubscribe at the link above. If you need to change your company, simply reply to this email with the change. If it's more convenient for you, keep up with us on Facebook. 650 S. North Lake Blvd. Copyright (C) 2009 - 2019, Scott Levitt - Oakley Signs & Graphics, Inc. All rights reserved.